The Solo manual, with original piston rails and slip removed. One of our most recent projects is the refurbishment of the manual keyboards on the magnificent four-manual Pilcher at the WWI Memorial Auditorium here in Louisville. We have been involved with the instrument nearly two years, and are making a significant push to get the instrument, now five years after being silenced to rebuild the console and switching relay, into suitable shape for giving concerts again by the Fall of this year. Though the stop actions and combination actions were rebuilt, the manual claviers were left in their original condition. This left the key tension with no adjustment (since the leather-nuts were popping off when touched). The original thumb pistons were also refurbished. 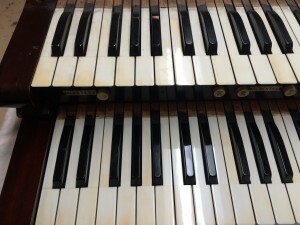 Though this effort of the organ’s previous caretaker was heroic, it turned out that the use of the original hardware was problematic when used in conjunction with the modern solid-state relay. We were faced with having to advise the client (in this case, the William H. Bauer Foundation, the non-profit organization who oversees and funds the organ restoration) as to a proper course of action. In this position, we have always concurred that the best course of action for this landmark, historic instrument is to leave things in as original condition as possible, using original methods and materials. Of course, the Foundation had wisely opted, when the unwieldy pneumatic relay was failing, to replace it with a modern relay, which returned the instrument to reliable, functional condition, especially in a setting where there is little chance for regular service. It was with this in mind that we advised to procure modern thumb-pistons, with reed-switch action. Philosophically speaking, when dealing with an historic instrument of note, we feel it is important to be conscientious towards the original conceptions and intentions of the original builder. As we charge full speed through the twenty-first century, we see that many of the magnificent instruments of the former two centuries have been either dismantled or fundamentally altered to reflect changing tastes. It is becoming much more rare to see instruments from these exciting periods in their original conceptions. Though the world moves onward, these instruments serve as time-capsules for a former day, often shedding light on perspectives of our trade that we have overlooked in the modern musical milieu. Those perspectives may not reflect our own, but they were important enough to our ancestors to go through the great trouble of putting them into production, laboring intensely for years (as pipe organs are still consigned to be produced) to accomplish their construction. Do we not owe it to the memory of these folks to give their conceptions respectful consideration when we are called upon to render them service? On the other hand, this need not be carried out to an extreme. An instrument must first serve the purpose for which it was intended, and if this purpose is not being served due to some defect, a conscientious remediation must be considered. For example, the organs of the 1920’s, such as the very one at the WWI Memorial Auditorium, were run through very complicated and intricate electro-pneumatic relays, which are very difficult to repair and expensive to rebuild. Except in a few extreme cases, these units are rightfully replaced with modern solid-state relays, which are simple in conception, easy to service, and are more reliable over time. 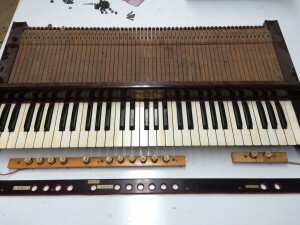 Of course, there is much gray area involved, and often it is not clear whether making a change to a particular part or system will affect the historical value of the instrument as a whole. One must consider the instrument holistically, and any proposed changes should be looked at in light of the principles articulated above. 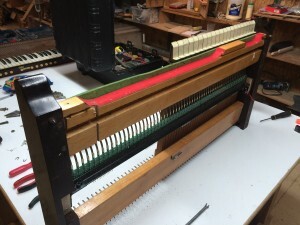 The Organ Historical Society has taken great strides in educating the general public about the proper methods of preserving an instrument, and their guidelines should be consulted, both by any builder in question and also by the owners of the instrument themselves. It was according to this line of thought that we have proceeded with the Auditorium instrument manual rebuild. 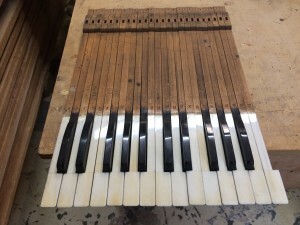 Restoration of the manuals themselves is rather simple, as the keytops are in marvelous shape already and merely need a good cleaning and new leather nuts. The thumb pistons will be replaced, as we already mentioned, with Syndyne reed-switch units. Reed switches, sealed in a vacuum and activated by a magnet, do not corrode or “drag” like the original exposed contacts, which causes unreliable action. We have worked with Syndyne’s on-staff engravers to choose a font which reflects the particular type already represented by the old pistons. Since new rails will be made up, we will alter the layout to include functions not available in the original combination action, such as sequencing, increased number of general pistons, and pistons that work some of the traps. The original units will be well preserved inside the organ for future reference and documentation. The original divisional name plates will be retained. Progress of the manual rebuild and of the rebuild of the organ in general can be seen from the “World’s Largest Pilcher” Facebook page.